Hi guys/girls. 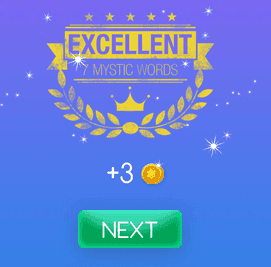 Welcome to Mystic Words White level 11 answers. Remember to look only the answers to the clues you are blocked. There is no fun if you see all the answers before trying to solve them first. A room in a palace 7 letters answer, click here! Necessary 5 letters answer, click here! An open skin infection 4 letters answer, click here! Strenuous effort 8 letters answer, click here! A person who is traveling 7 letters answer, click here! Almost not 6 letters answer, click here! Formal religious observance 8 letters answer, click here!